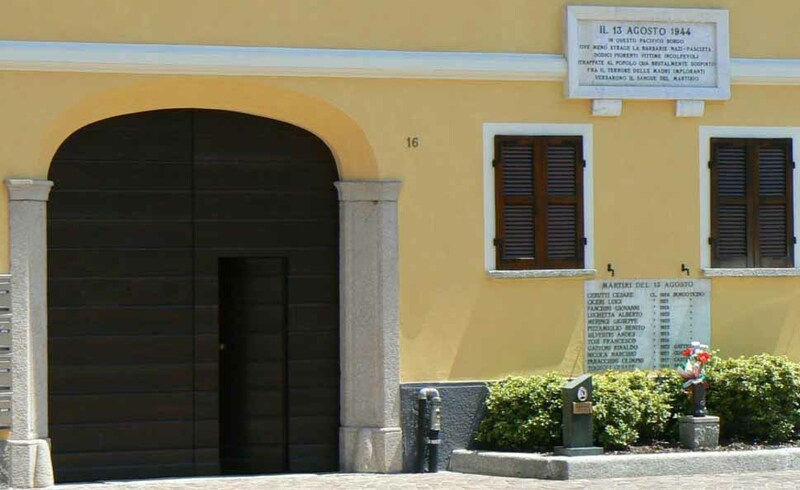 The Antica Casa Balsari was built in 1695 and is located in the main square of the town of Borgo Ticino, close to the Town Hall. Originally, the house was the home of the Balsari family, who were 18th century Pharmacists, later with a pharmacy overlooking Piazza Martiri. 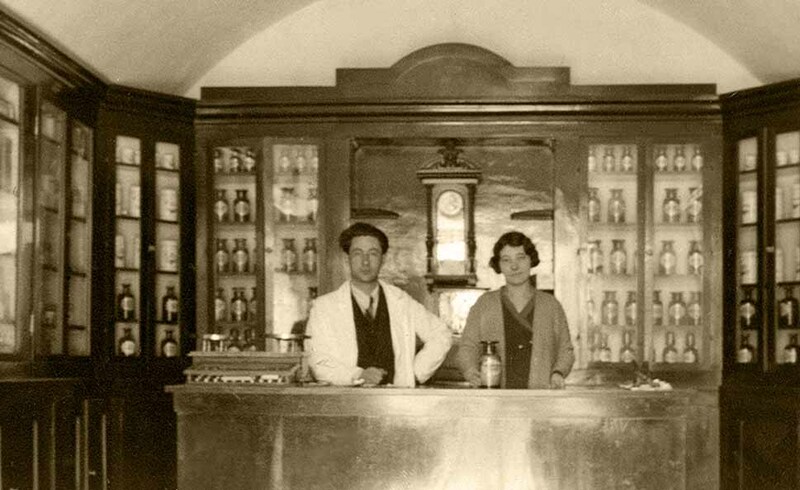 During the fascist reprisals of 13th August 1944 the pharmacy was destroyed by German military forces and all the historical heritage of antique furniture and pharmaceutical prescriptions and recipes were lost. To revamp the Balsari family’s passion for music, the building has been decorated with a musical theme, books and instruments. Each apartment is a tribute to a renowned Italian composer to celebrate our Italian cultural heritage. Some archaeological findings dating back to the civilization of Golasecca between the ninth and seventh centuries BC indicate that Borgo Ticino has been inhabited since prehistoric times. These findings were between Borgo Ticino and Castelletto, near Madonna delle Grazie Church. In Roman times there was a Roman Castrum (where today there is Gagnago area) which was part of the municipium of Plumbea (Pombia). Borgo Ticino was founded around 1190 at the behest of the town of Novara, who built a village in order to move people from Lupiate. Initially, the name given to the new village was Borgo di Lupiate and in the second half of the thirteenth century the name changed to Borgo Ticino. Between the thirteenth and fourteenth centuries the new village acquired a certain importance for its crafts, especially thanks to the guilds of shoemakers and blacksmiths. In the fifteenth century Borgo Ticino became part of the domain of the Duke of Milan, was given in fief to the Visconti and after to the Borromeo, who owned it until the eighteenth century. 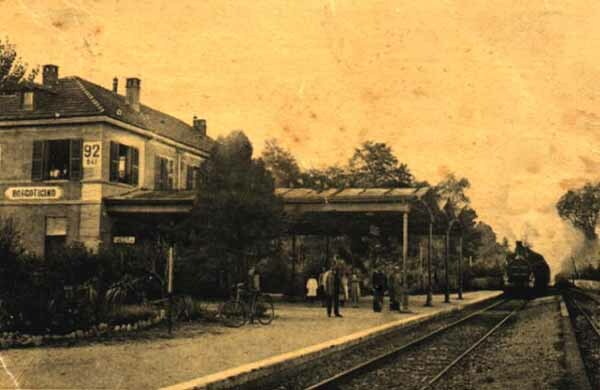 During the nineteenth century, Borgo Ticino reached its pinnacle in textile manufacturing (spinning, painting, cotton and moleskin) and due to the increase in trade and the construction of the Novara-Arona railway. Borgo Ticino became the seat of the district and judicature court and the office of the Royal Gabelle. During the Second World War the woods surrounding Borgo Ticino became a hiding place for the partisan brigades who operated in the area. The inhabitants of Borgo Ticino were involved in supporting partisans and were therefore subjected to nazi-fascist reprisal taken against the rebels. On Sunday, August 13, 1944 during the celebrations of the town’s patron saint, trucks of Nazi SS soldiers commanded by the naval captain Valdemar Krumhaar and soldiers of the X Mas Flotiglia led by Lieutenant Ongarillo Ungarelli entered the town. 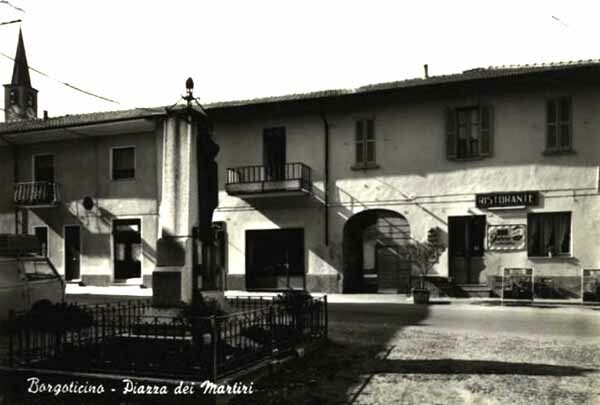 Soldiers armed with mortars, machine guns and automatic weapons blocked the village, entering homes and forcing the inhabitants, mostly women, children and elderly people in to the square now called “Martyrs Square”, Piazza Martiri. That morning a German convoy had been attacked by partisans at the San Michele, between Borgo Ticino and the town of Divignano . During the exchanges four German soldiers were wounded. At that time, the law required that for every German soldier killed ten Italians would be executed. Although in that attack no soldiers had been killed, captain Krumhaar decided that for every German soldier wounded three young Italians had to die, plus one, since one of the German soldiers injured was in a serious conditions. Thirteen terrified young people, all under the age of thirty were choosen at random from the crowd. They were lined up against the wall of the Balsari Pharmacy. In exchange for not shooting the young men and burning the village, captain Krumhaar requested 300.000 lire compensation. Despite receiving the compensation from the villagers the firing squad still shot the young men (during an inquest into the massacre the german officer responsible for the shooting said that ” the money was not enough to compensate for the German blood “). Only one of the thirteen victims survived the shooting, their names were: Virginio Tognoli, Francesco Tosi, Nicola Narciso, Giovanni Fanchini, Cerutti Franco, Benito Pizzamiglio, Alberto Lucchetta, Luigi Ciceri, Rinaldo Gattoni, Andes Silvestri, Olimpio Parachini, Giuseppe Meringi. Their names are engraved on a marble commemorative inscription on the façade of Casa Balsari. Following the shooting the SS and X-Mas forces plundered and burned the village. The relatives of the victims were prevented from recovering the bodies for burial until the following day. Before leaving, the soldiers placed mines in some houses including Casa Balsari House. However, for intimidatory reasons, it was important to leave the dead bodies exposed and not covered by debris. For this reason the house was not destroyed.